On occasions my customers are shocked at what it will cost to do certain repairs. Little do they know, I too am shocked at the process needed to complete such repairs. Do those who design and engineer vehicles really think what it takes, to include the cost, on these newly designed vehicle. Recently one of my long time customers brought in her 2003 Hyundai Tiburon GT for the 60,000 mile service. While this includes replacing the timing belt, water pump and associated components, it also needed a tune up. On this vehicle all that would consist of is spark plugs and plug wires. That sounds rather simple, you would think. Well not on this model. Three of the six spark plugs are easy to access, but in order to access the other three, you must remove some of the components on the top of the engine, since they are located directly underneath. Replacing the timing belt was easier than replacing the 3 spark plugs and just as costly. I remember starting my career on vehicles that were fairly easy to work on in the early 1970s. Today I sometimes wonder if you need to have some engineering back ground to help complete the job. On this engine you must remove the Surge tank and disconnect some of the components attached to it. Then you have to find those strategically placed hidden bolts. Three to be exact and having small hands like mine is a must for this portion. Remove the surge tank and other attached components then proceed to replacing the other three spark plugs. It is highly recommended to replace the plug wires while you are there and be sure to put Anti Seize on all spark plugs before installing the new ones. This will save on problems down the road. Some do not recommend replacing the surge tank/intake gasket since it can be reused, but I have found it better to replace it so you have a tight seal. 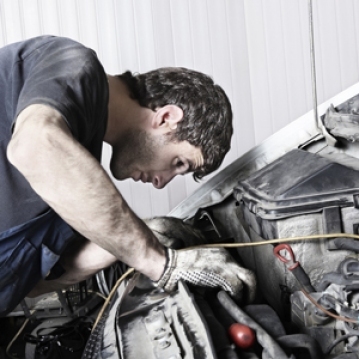 If it leaks, the car will have an air leak and the vehicle will run poorly. The gasket costs in the neighborhood of approximately $2. Cheap insurance. With this particular customer, I allowed her to observe what it entailed to do this service and after it was ready to roll, she had a much better understanding of why it took about 2 hours of labor. Of course when customers are present it always seems you hurt yourself more often, probably because you know someone is watching, so keeping from cursing was a challenge. I would rather have my customers understand how the repair or service needs to be performed so they feel as if they are getting what they pay for. So if you do not have a regular mechanic, shop around. Even do a little research on the Internet. This way you are prepared ahead of time on what it should really cost.